Commencement is the official ceremony celebrating students and their work. This year’s ceremony will be Thursday, May 9, 2019 from 4:30 – 6:00 PM with a reception to follow. If you complete degree requirements between June and May of the following year, you will be invited to the current year commencement ceremony. If you are not done with your requirements but anticipate being done by May, you will be invited to participate as long as you are registered for all of your final requirements in the spring semester. 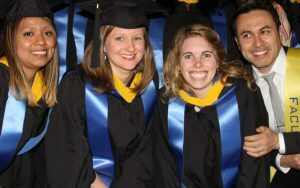 You will need to apply by the posted deadlines to make sure your name will not appear on the commencement program. Invitations to Commencement are emailed to College-issued student email accounts during the spring semester to eligible students. You are eligible to request a maximum of six tickets. We ask that you request only the number of tickets that you will actually use. You as the graduating student do not need a ticket, nor do children. Our ticketing policy is meant to ensure that the Bank Street community can come together as one for Commencement. Therefore, we are unable to grant extra tickets. Additional ticket request and multiple RSVPs will not be granted. You must RSVP via the event link sent to your College-issued student email address. You will get an email to your College email account with information regarding ticket pickup. We give our students the option of wearing a cap and gown. You can order a lightweight black cap and gown, master’s hood, and black tassel from an outside company. The day of the ceremony, Bank Street will provide a sash in the school colors to all graduates, regardless of their choice concerning caps and gowns. Please note: Caps and gowns will not be available for purchase at the church. 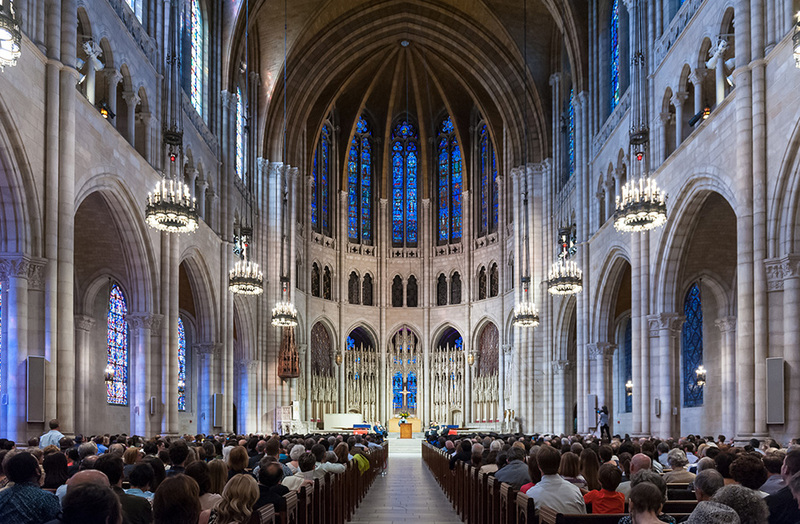 Each year, the Commencement ceremony is held in the beautiful Riverside Church, on Riverside Drive between 120th and 122nd streets. There are two entrances to the church: one at 91 Claremont Avenue, which should be used by students and faculty, and the other at 490 Riverside Drive, which is to be used by all guests. Students are asked to arrive to the South Hall no later than 3:15 PM. Guests should arrive no later than 3:30 PM to be seated by 4:15 PM. A catered reception will be held at Riverside Church in the South Hall immediately following the ceremony. Generally, the ceremony concludes at 6:00 PM and the reception ends at 7:30 PM. We look forward to celebrating you with your guests. If you are unable to attend the ceremony at Riverside Church for religious reasons, we are pleased to invite you and your family and friends to a special ceremony and reception at Bank Street College at 4:30 PM. If you plan to attend the ceremony, please contact Bettina Tillman in the Registrar’s Office at blt@bankstreet.edu to RSVP. Only those students who RSVP will be permitted to attend the special ceremony. Caps and gowns are optional. Diplomas are not distributed at Commencement and will be mailed to students approximately two months from the date of graduation. Diplomas are mailed to the address you indicated when you filled out your electronic Graduation Application. If you need to change the address where your diploma will be sent, please email registrar@bankstreet.edu. Diplomas will not be sent to students with holds. All financial obligations must be settled with the Business Office and books borrowed from the Library must be returned. Questions regarding diplomas should be sent to Bettina Tillman at blt@bankstreet.edu. Frances Lucerna has been a pioneer of community arts and education for more than three decades. She pursued her artistic passion as a professional dancer for 10 years and in 1980 returned to her community in Williamsburg, Brooklyn and realized her vocation as the founder of the Williamsburg Arts & Culture Council for Youth. It was the first performing and visual arts programs for Latino and African American adolescents in Williamsburg. In 1982, Ms. Lucerna became co-founder of El Puente, a nationally recognized community/youth development organization nurturing holistic leadership for peace and social justice.